Whether you are napping in the hammock or stargazing from the hot tub... You will enjoy this relaxed beach house. Only 255 yards to the beach with direct access. Wooded, double lot offers plenty of space and privacy. Lofted upper room with panoramic horizon ocean views, perfect for coffee and sunrise. A lovely sitting room, complete with restored Penn. Farmhouse floor (circa 1850), brings old home charm to the beach. 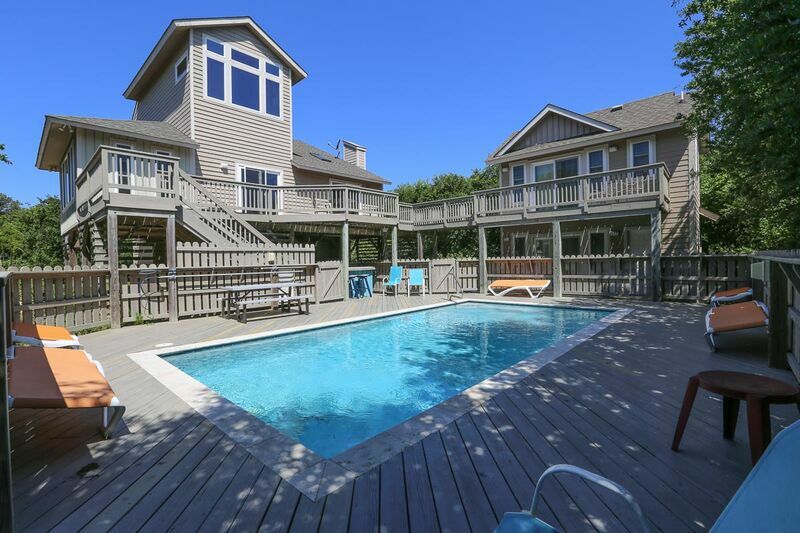 Beautiful pool and two poolside bedrooms separate from the main house but connected by decks. Great room with cathedral ceiling, dining area, kitchen and sitting room. Master bedroom (with Queen), bath (with tub and shower). 2 bedrooms (1 with Queen, 1 with Queen and Bunk set), bath (with tub and shower). 2 bedrooms (1 with Queen, 1 with Queen and Twin), 2 baths.